I paused while walking along the old main street in Cody Wyoming, and looked up a long flight of old, short wooden steps. I could hear them creaking before I made my first step. What drew me in? The smell of leather and the sign of the Saddle shop. I’m a western romantic; an urban cowboy. 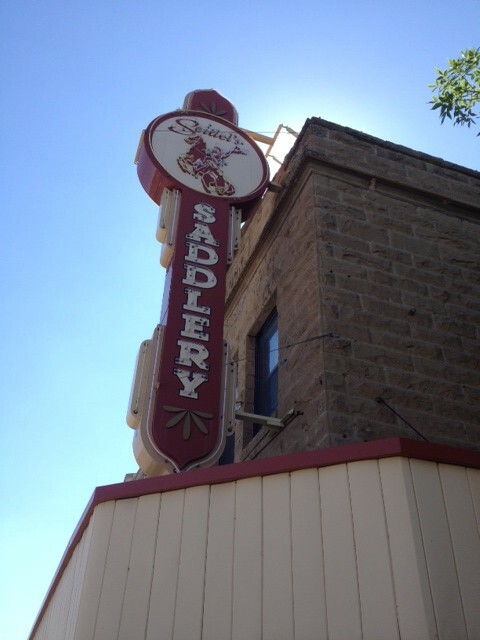 The saddle maker could hear me coming for about 27 steps and I ,of course, looked like a typical tourist- not in my cowboy garb but a beach shirt and shorts. What a cool looking shop; and he was the only one in it. He is Keith Seidel, owner and journeyman. He started working in a cobbler shop at age 11. Soon he was apprenticing in a local saddle shop, and by age 18 he was traveling to other cities to work in saddle shops and gain all he could. 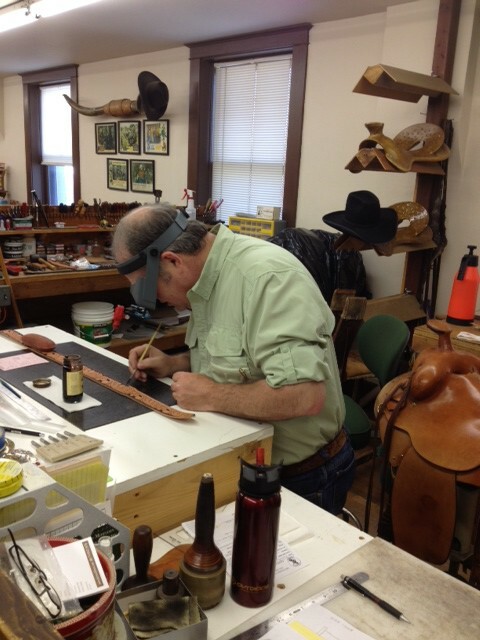 It wasn’t too many years before he hung his own shingle, and is now one of the top ten saddle makers in the world. He has a four year back log of work. The average saddle he makes takes about 300 hours. For that he charges about $25,000 per saddle. He has made a great life of this, loves what he does, but his craft is a dying breed. I looked around and found him to be the only one there. Do you have any employees or apprentices? I ask. And this is where the real lessons started to come out. He said he can’t find good help. The youth of today he said don’t want to work hard, they want a big pay check NOW, and they won’t put in the time to develop a skill or learn a trade. They can’t stop using their thumbs enough to also use their fingers, and texting and saddle making don’t go together at the same time. So he gives a class now and then, charges for any apprenticing that might come along, and continues to make some of the finest saddles in the world. I thought how sad this was that such a fine man and saddle maker didn’t have a couple of apprentices working alongside; that when he stops, the shop stops, that when he turns out his last saddle, that’s it. Think about any profession, and see if these lessons don’t apply. You have to work hard. You have to take the time to become expert at what you do. You must continually educate yourself, practice what you learn, and teach what you learn to others. No one will go through the process of apprentice to journeyman watching from the sidelines. To our younger generation especially I want to emphasize the value of time. Take the time to develop your skills, and one day you too will metaphorically be selling twenty five thousand dollar saddles. But to do this, to reach a pinnacle where you can make your mark and make a difference requires a fortitude that is uncommon. To my young friends: stay in the saddle! 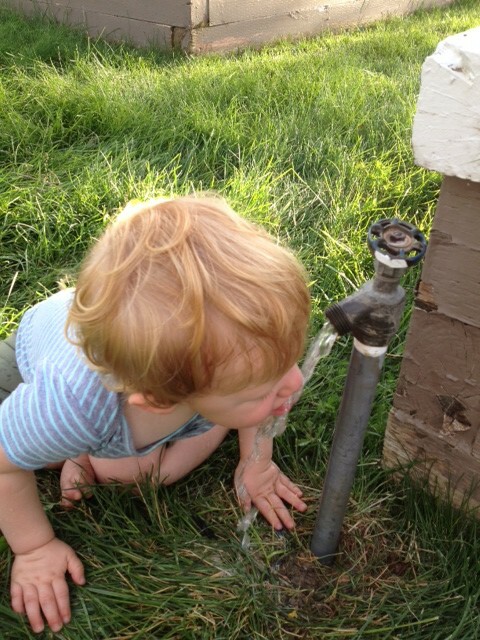 At the end of a hot summer Colorado day, I followed my grandson around the yard after dinner. He is at that stage where he pokes out his tummy, his rear is equally pushed in the opposite direction, and he kind of rolls on his fat little baby feet; teetering like he is about to fall at any moment, but somehow keeps his awkward balance. I marveled at his unfettered interest in things and his willingness to take chances; all while I am acting as a human shield to keep him from falling off of steps which to us would be like falling ten feet. The sprinkler repair crew was just finishing up and had the front sprinklers on a test. He simply walked into the middle of the action and laughed as the sprinklers rained on him every few seconds. WE would be worried about our clothes, getting wet at an inopportune time, or would be running from the cold water. He took time to feel the different surfaces below his feet- wet concrete, grass, pine cones and mud. He picked up pine cones and threw them to me- he likes to play catch but hasn’t learned how to catch yet, so simply delights in the throw. How often do we take gleeful delight in a task which we don’t know the half of? At one point he stooped down to put his little hand in a pipe, and pulled out a bug- proudly handing it to me as I jumped back. This went on for about an hour. My wife was up at the garden area pulling weeds from the flowers. I turned on the spiket adjacent and watched. He was very thirsty, but WHO taught him to drink out of a spiket? He figured out how to drink from a pipe in just a few moments. Very trusting of the water, very appreciative it just happened to be there. What a wonderful world we do live in; we can observe the little things with a little one as they take in every moment as new and exciting; wobbling around the world seemingly without purpose, but with a definite sense of direction, ad hock as it may be. WE need to find again our own fountain of youth, and drink from it unabashed. Who cares if the world is watching us stand in the midst of sprinklers with our cloths on? Let’s commence our aimless wobbling. Amateur Joy is a term I recently learned from a favorite author. Sometimes we look forward to all big, Big, BIG events- we love the anticipation. Our friends or family will say regarding a recent play or movie “you gotta go!” or may gush with enthusiasm over the latest theme park. When you think about it, every great event must be followed by an even bigger event. A sequel, or a bigger roller coaster, everything is big, Big, BIG! We sometimes need to remind ourselves of the sweet experience of amateur joy. My author friend used the likeness of this to a quiet church service, a walk home in the silent night, soup and bread, some old songs with friends around a fire, a warm bed- these sorts of things. The work of amateurs. I recently had a painting commissioned (by the very talented Glen Hopkinson) surrounding my great, great grandfather, Byron Sessions. I grew up in the town with his name on it (so did the artist). It wasn’t his grandeur for which he was celebrated; it was his soft and faith filled leadership which made everyone feel included. 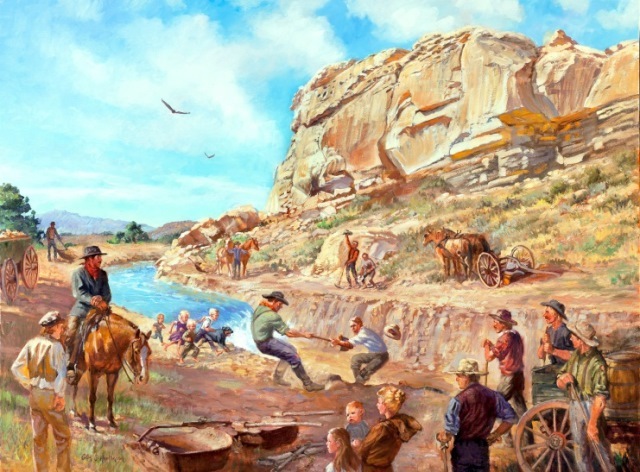 The painting entitled “Sidon Canal at Prayer Rock 1902” has in it our grandchildren, celebrating the water first coming into the Sidon canal which has for over a hundred years now, watered the Big Horn basin of Wyoming. The painting has a story of faith behind it, and shows the celebration of simple, yet powerful things. 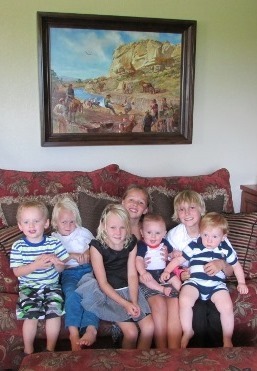 It was a neat experience to place the grandchildren on the seat in front of the painting where they are actually painted in. As they grow up, they will be able to closely associate with their heritage as we celebrate the simple, amateur joy that is the most meaningful—-even when compared to the biggest roller coasters in the world.